Have you lost a tooth despite your best efforts to protect your smile? Whether due to decay, disease, or trauma, you are now left feeling insecure about your appearance. Not to mention, eating certain foods and speaking clearly has become a challenge. You do not need to live with an incomplete smile. Dr. Cedric C. Chenet can fill the empty space with a dental implant crown in Viera. You will regain the next best thing to your natural tooth with a solution that has the potential to last for several decades. Every tooth in your mouth is invaluable to your oral health. When even one is missing, serious complications begin to brew beneath the surface of your gums. The lack of a root causes your jawbone to deteriorate. Over time, this makes your remaining teeth lose support. 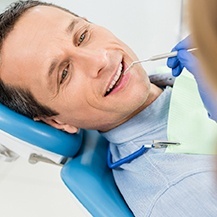 They begin to shift toward the open space, leading to alignment and bite issues while also increasing the risk of tooth decay and gum disease. As time passes, inadequate support can cause the adjacent teeth to loosen and eventually fall out. A fixed bridge is an affordable treatment that uses a prosthetic tooth to bridge the gap between your teeth. The device is held in place by attaching dental crowns to the adjacent teeth. This provides a quick and convenient solution; however, it needs to be replaced about every 5 years. In addition, it does require permanently altering healthy teeth and it will not stop bone loss. 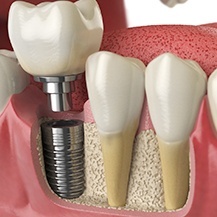 Now, more than 500,000 people per year are turning to dental implants to replace their missing teeth. 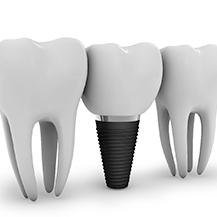 A biocompatible implant post is surgically inserted into your jawbone to replace the root. An abutment is attached to the post to connect a custom-made crown. Unlike a traditional bridge, it stops bone loss and can last for several decades due to the use of a titanium implant post. Stimulates new growth in the jawbone. Can last for 30 years or more. Although dental implant cost more upfront than a traditional bridge, they will eventually pay for themselves because they do not need to be replaced if you care for them properly. You can restore a healthy, functional smile with a treatment that looks and feels natural. Your dental crown is crafted to match your remaining teeth to blend in seamlessly when you smile. 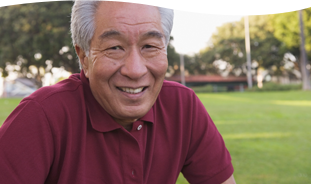 If you are ready to stop living with the challenges of missing teeth, Dr. Chenet can help. 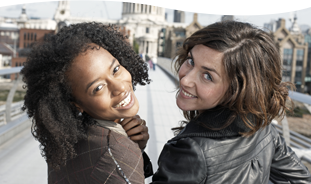 Contact our office today to see if dental implants are right for you.